Albert George Gale was born on the 22nd of August 1894 in Dorking to general labourer, bricklayer´s labourer and contractors foreman George Gale and Annie Gale nee West. 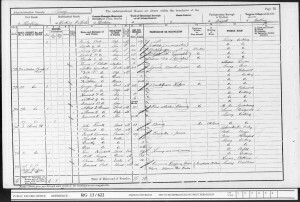 Albert George´s father George Gale was born in the 1st quarter of 1859 in Dorking Surrey to farm labourer Jonathan/John Gale, born about 1818 in Fetham, Surrey, and washerwoman and charwoman Mary Gale, born about 1820 in Dorking, Surrey. Albert George´s mother Annie West was born about 1869 in Capel, Surrey to labourer James West, born about 1835 in Capel, Surrey and Anne/Annie West, born about 1838 in Reigate, Surrey. Annie West was baptised on the 8th of August 1869 at St Mary´s in Holmwood, where the family lived at this time. During the time of the 1891 Census, Annie West and her sister Fanny were working as cook and housemaid of ironmonger Richard P. Rickman at 22 Rose Hill in Dorking. 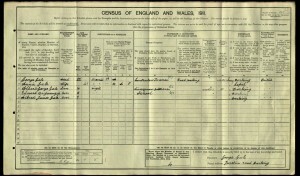 George Gale and Annie West married by Banns on the 26th of December 1891 at St Mary´s in Holmwood, where both lived. Annie´s sister Fanny was one of the witnesses. 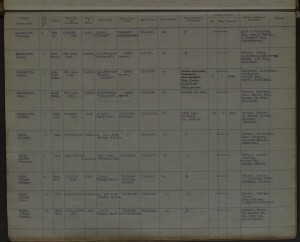 He had three brothers: Leonard Frank Gale born on the 28th of September 1892 in Dorking Surrey, Edward Benjamin born in the 1st quarter of 1901 in Dorking Surrey and Alfred James born in the 1st quarter of 1908 in Dorking Surrey. At the time of the 1901 Census, the family lived at 25 Meadowbrook Road in Dorking. George was working as a bricklayer´s labourer and Annie was looking after their sons Leonard Frank, Albert George and Edward Benjamin. Albert George was educated at the British School in Dorking. At the time of the 1911 Census, the family lived at Junction Road in Dorking, Surrey. George was working as a contractor´s foreman, Annie was at home, Albert George was working as a nurseryman gardener. Edward Benjamin and Alfred James were scholars. Annie stated that she had given birth to four children. The accommodation had four rooms. 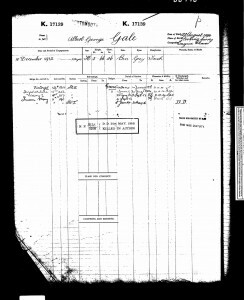 Albert George Gale enlisted into the Royal Navy on the 10th of December 1912 for the duration of 12 years. His service number was: K.17139. He was over 5ft tall, with a chest measurement of 36inches. Albert George had brown hair, grey eyes and fresh complexion. At the time of his enlistment Albert George was working as an engine cleaner. Albert George served as a 2nd stoker on the HMS Victory II from the 10th of December 1912 to the 14th of June 1913, from June 1913 to August 1913 on the HMS Irresistible and from the 21st of August 1913 to the 3rd of September 1913 on the HMS Victory II again. Finally he served on the HMS Queen Mary. 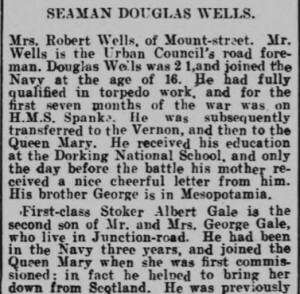 He served there as a 2nd stoker from the 4th of September 1913. He joined the Queen Mary when she was first commisioned. In fact he helped to bring her down from Scotland. In January 1914, Albert George was promoted to 1st stoker on the HMS Queen Mary, where he served until his death on the 31st of May 1916. 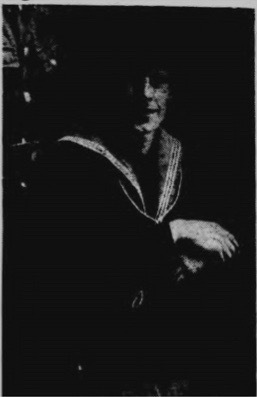 Albert George Gale died on the 31st of May 1916 whilst serving as a 1st stoker on the HMS Queen Mary, which sunk during the Battle of Jutland. 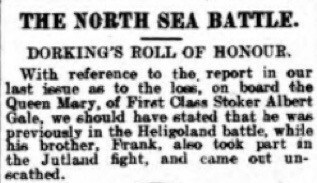 The Battle of Jutland was fought in the North Sea, near the Danish Jutland Peninsula. It was the largest naval battle during WW1. Albert George is commemorated at the Portsmouth Naval Memorial on panel 18. His body was never found. 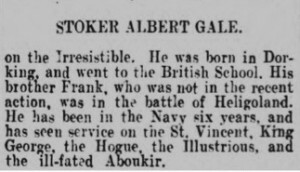 Albert’s brother Leonard Frank Gale was engaged in the Battle of Heligoland, and had been serving on St Vincent, King George, the Hogue, the Illustrious and the ill-fated Aboukir. Leonard Frank died on the 3rd of January 1919 after accidently falling overboard the HMS Lucia. At the time of Albert George´s death his family lived at 5 Junction Road in Dorking, Surrey. Albert George´s mother Annie Gale died in June 1922 in Dorking. Albert George´s father George Gale remarried at 65 years of age to 37 years old Gertrude May Howard. The marriage took place by Banns on the 6th of July 1924 at St Paul´s in Dorking. Gertrude was a daughter of farmer Arthur I. Howard. George Gale and Gertrude lived at the time of their marriage at 7 Clifton Terrace in Dorking, Surrey.